February 16, 2006JEMH van Bronswijk, Technische Universiteit Eindhoven 1 7y750 – Robotics and homecare for dwellings (Domotica) 7y750 – Robotics and homecare. 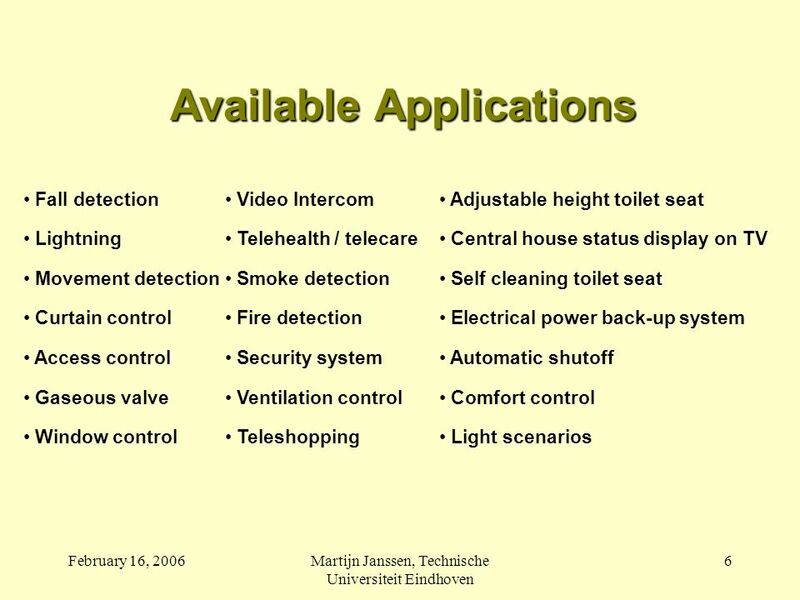 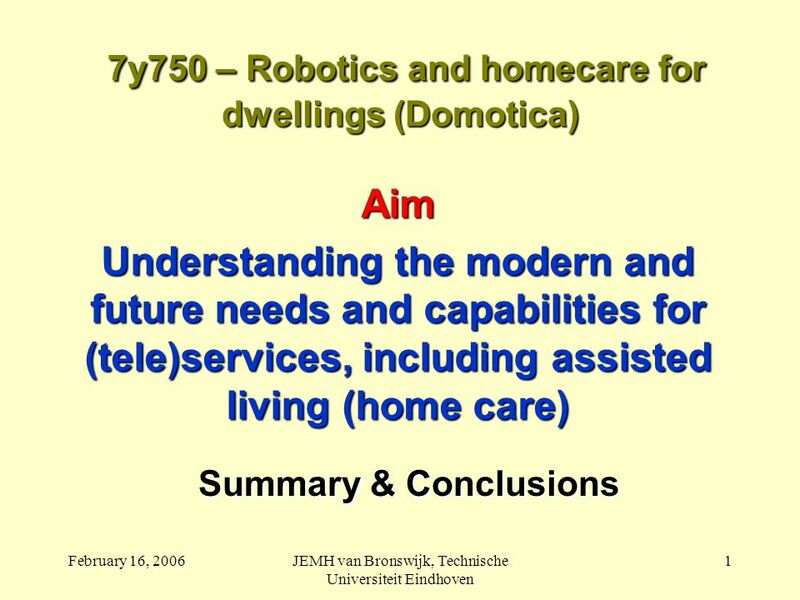 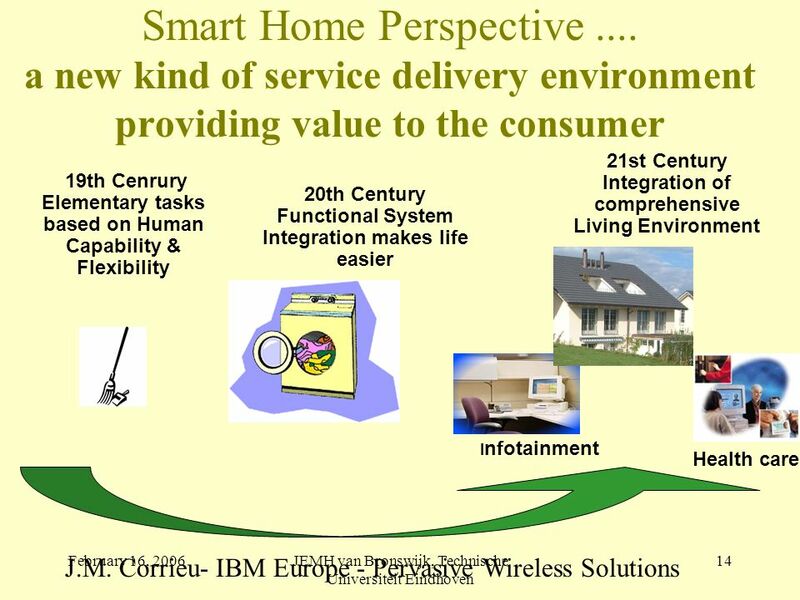 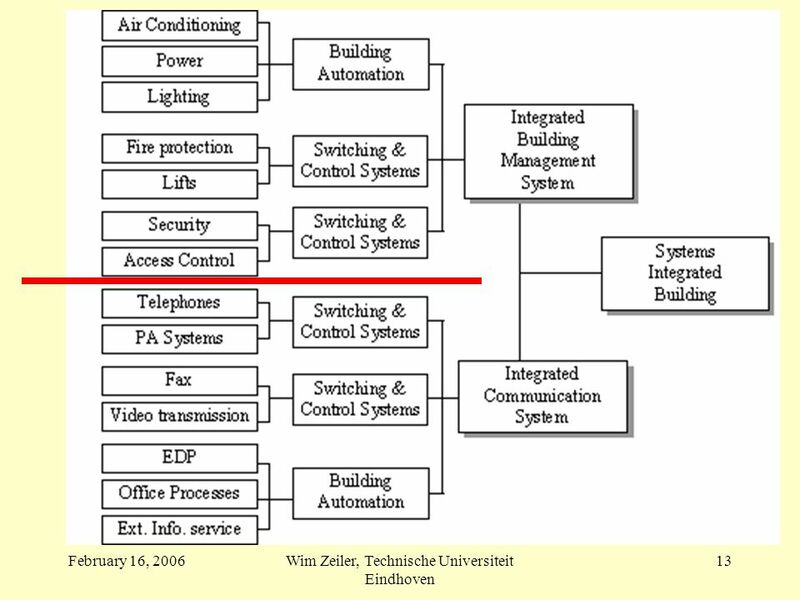 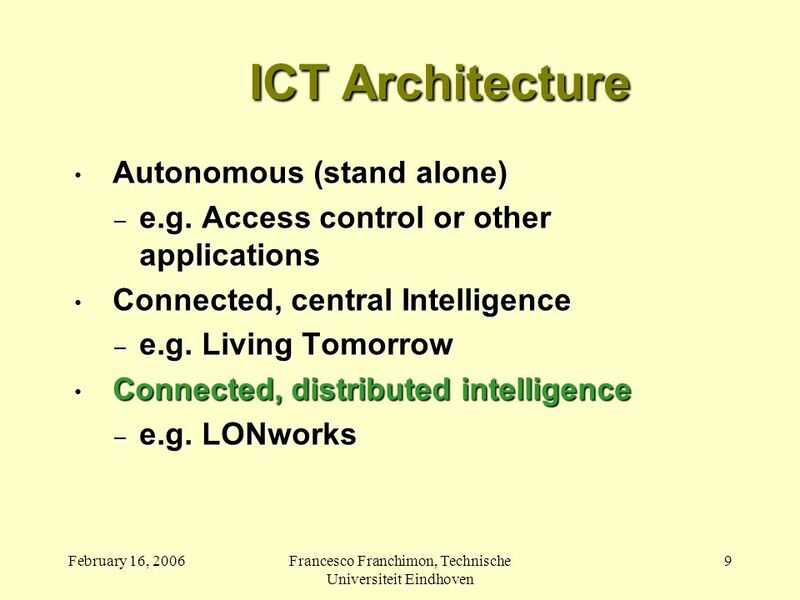 Download ppt "February 16, 2006JEMH van Bronswijk, Technische Universiteit Eindhoven 1 7y750 – Robotics and homecare for dwellings (Domotica) 7y750 – Robotics and homecare." 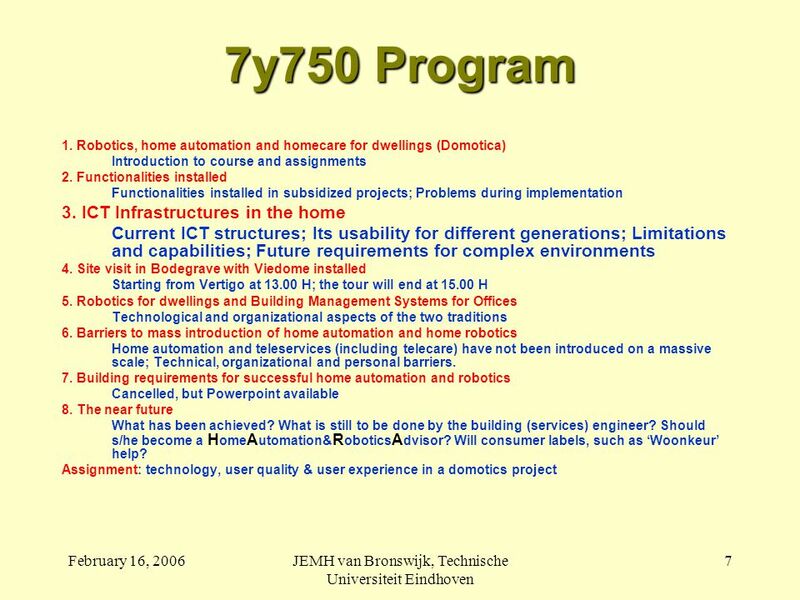 May 22, 2006JEMH van Bronswijk, Technische Universiteit Eindhoven 1 1 st ISG Master Class Gerontechnology Sponsored by the International Society for Gerontechnology. 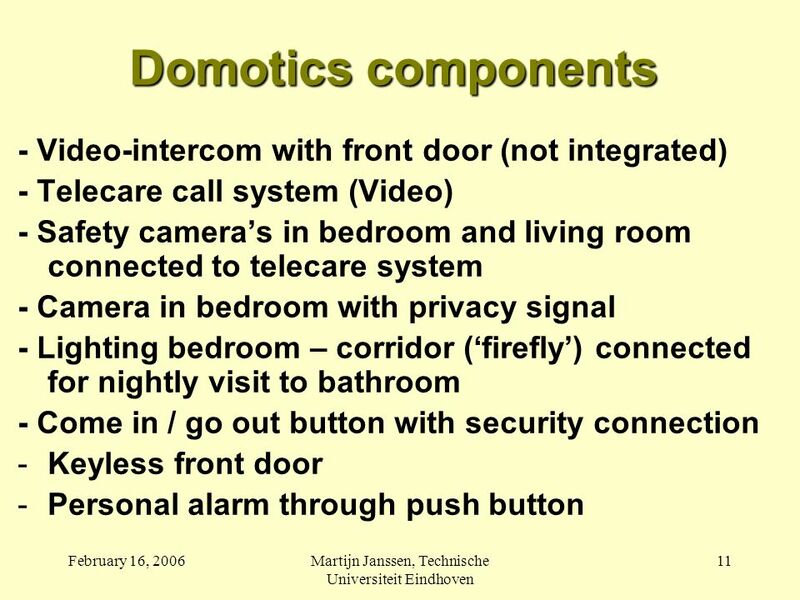 November 29, 2004JEMH van Bronswijk, Technische Universiteit Eindhoven 1 Domotica – 7y750 - Domotics What it means and its anticipated results. 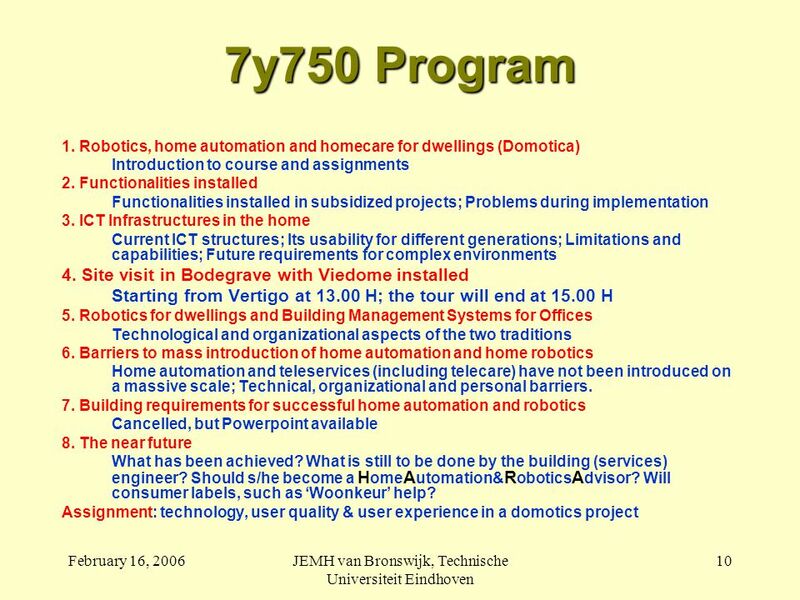 November 2007JEMH van Bronswijk, Technische Universiteit Eindhoven 1 2 nd ISG Master Class Gerontechnology Sponsored by the International Society for Gerontechnology. 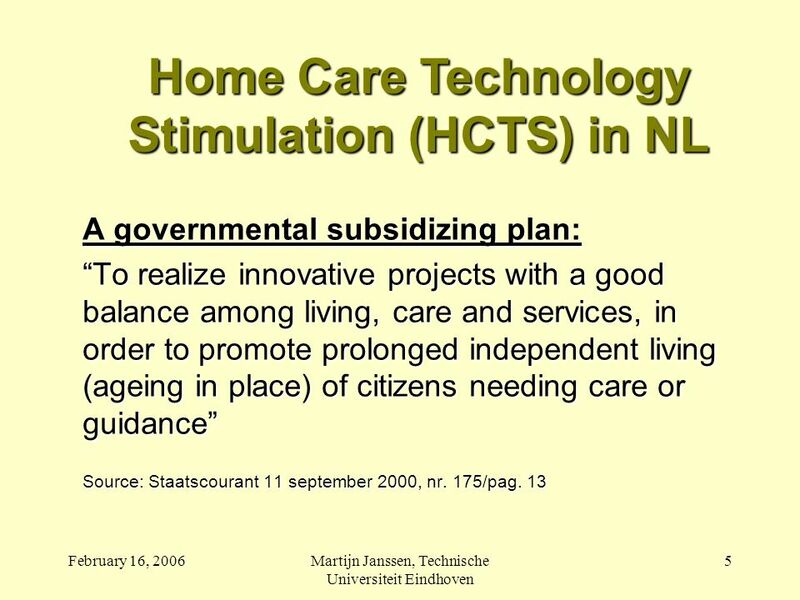 Training to care for people with dementia Dementia Training Partner logo here Training support Skills development Competency Assessment Scholarships Education. May 10, 2008JEMH van Bronswijk, Eindhoven University of Technology 1 Interdisciplinarity of Gerontechnology 2008 International Master Class Nankai Institute. 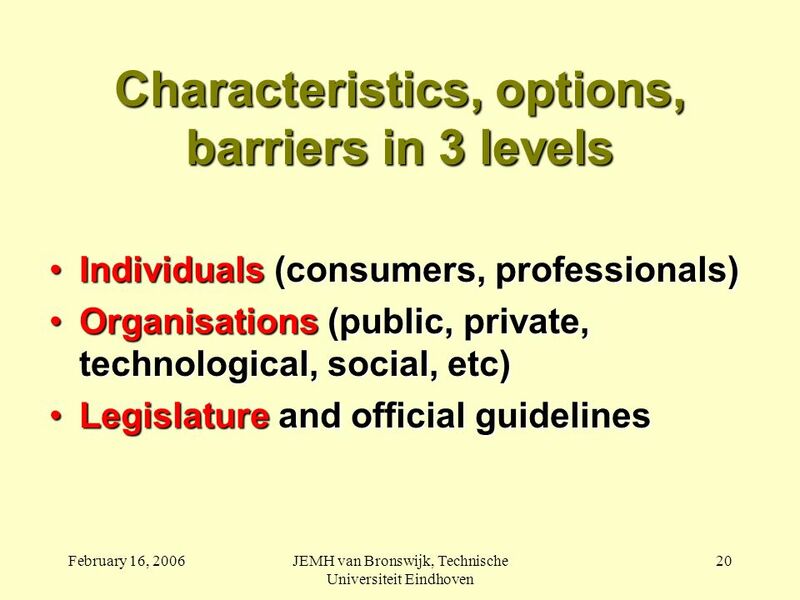 Health & Comfort August 24, 2005JEMH van Bronswijk, TU/e, Eindhoven 1 Health & Comfort in a sustainable society Introduction to Course 7y710. 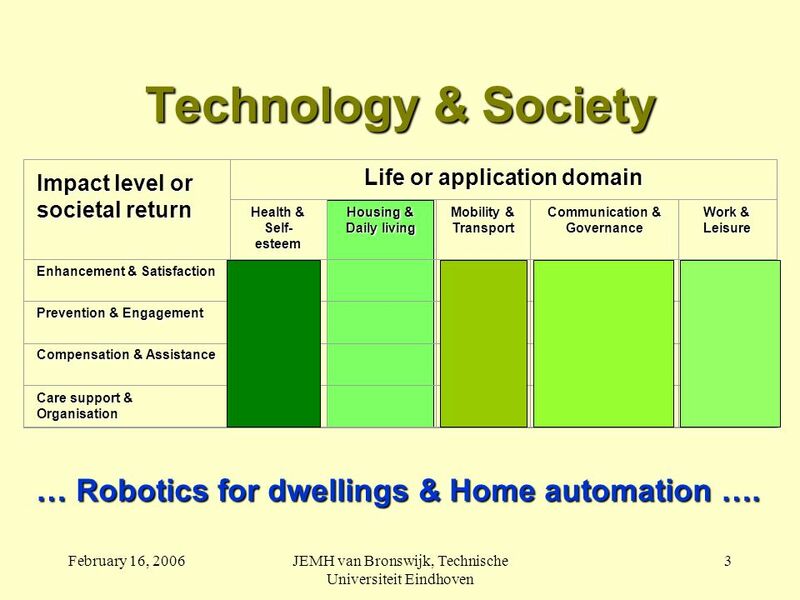 November 28, 2007JEMH van Bronswijk, TU/e1 The Aging Society and Inclusive Design Taking care of societal change. 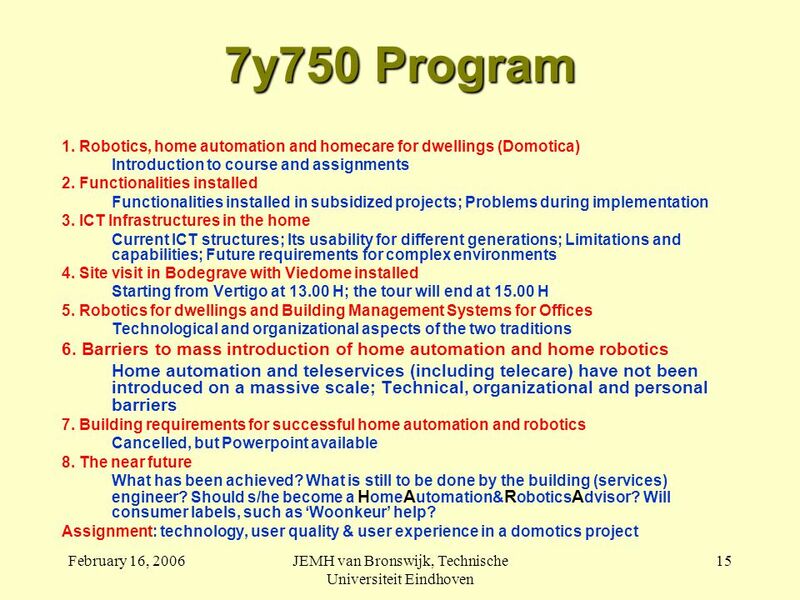 8 december 2005MH Janssen, Technische Universiteit Eindhoven 1 7y750 – Robotics and homecare for dwellings (Zorgdomotica) Functionalities installed. 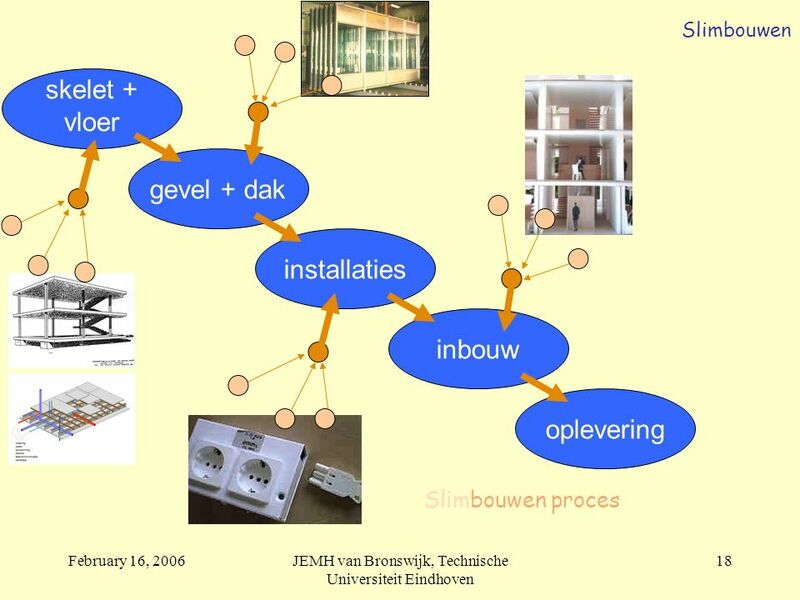 October 25, 2003JEMH van Bronswijk TU/e, October 25, Health & Comfort Our Aim was: Explaining and applying the principles of built environments. 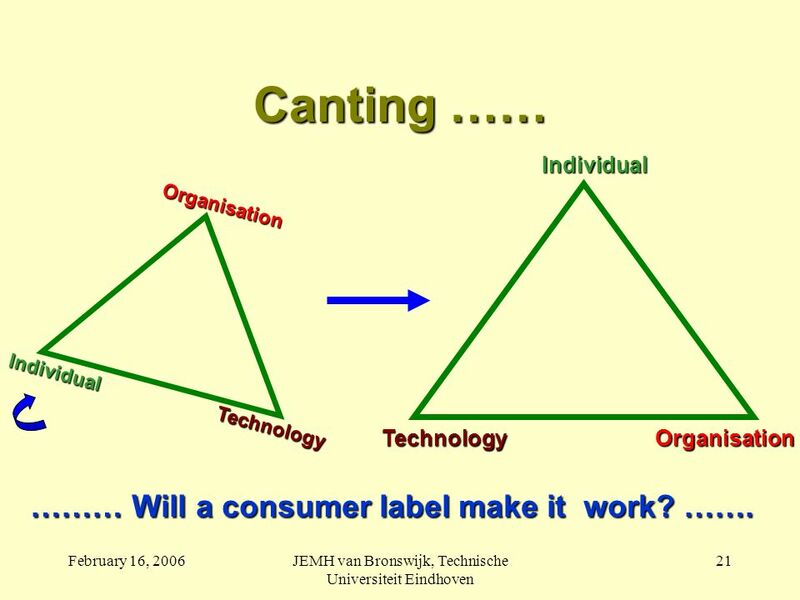 May 9, 2008JEMH van Bronswijk, Eindhoven University of Technology 1 Basics of Gerontechnology 2008 International Conference on Gerontic Technology and. 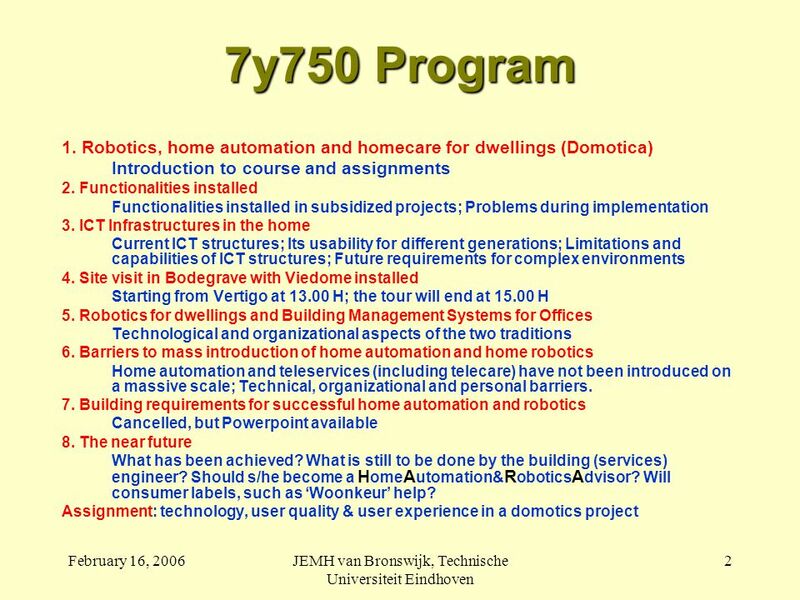 November 30, 2005JEMH van Bronswijk, Technische Universiteit Eindhoven 1 7y750 – Robotics and homecare for dwellings (Zorgdomotica) Introduction to course. 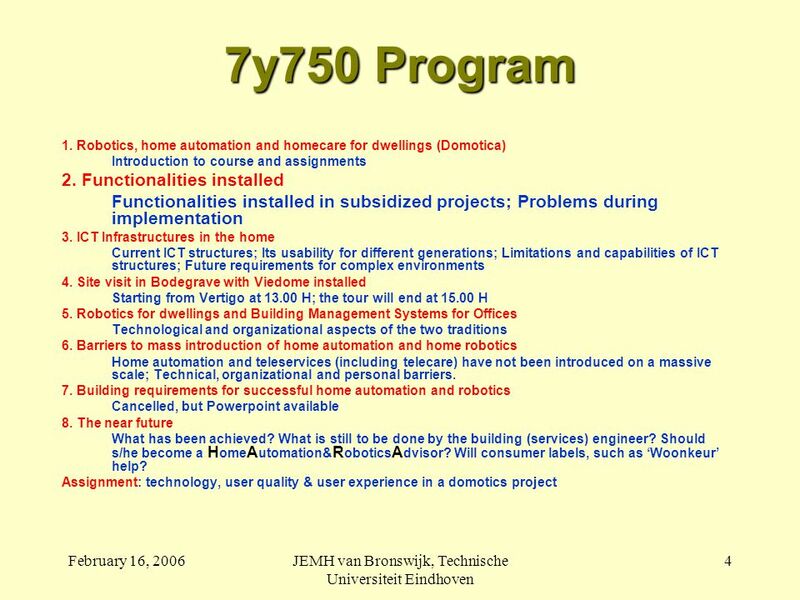 May 12, 20087y910 - JEMH van Bronswijk, TU Eindhoven 1 Home automation & Robotics Summarizing. 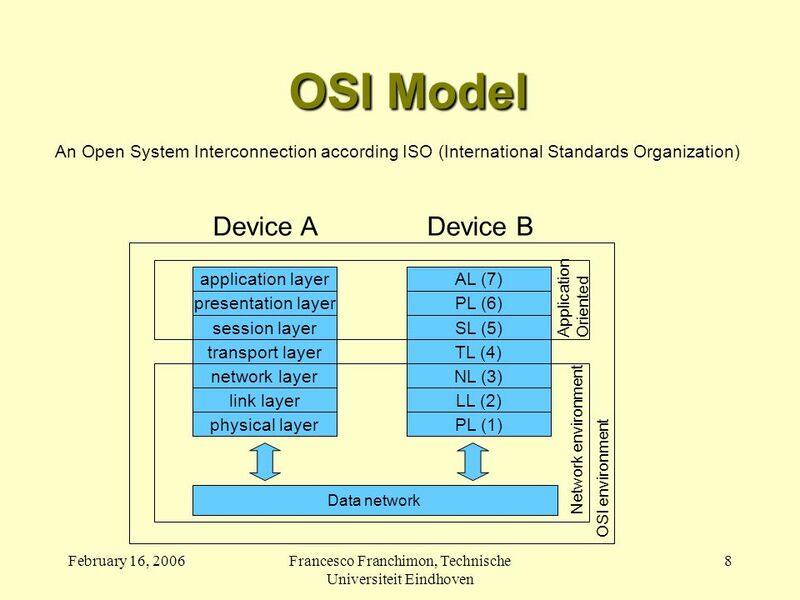 Ying Wang EDN 303 Fall Objectives Define curriculum-specific learning Explain the difference between computer, information, and integration literacy.